Occassionaly we ask our customers if they would like to exhibit in the shop. Pete was asked, and he came back to us around a year later with his newest artwork. We love the colours, texture and boldness of his painting. Kilbeacanty man, Pete Lambert, has been painting for the last 7 years and enjoying every minute of it. He works primarily with acrylics and his pieces embrace colour and the abstract. He likes to put on some jazz and see where the painting takes him. He has no one artistic hero but is inspired by the likes of Japanese printmaker , Hokusai, the design of Saul Bass and the photography of Franco Fontana . If you would like to enquire further about Pete Lambert’s paintings, please visit the studio for contact information. Pete Lambert’s art work will be on display in Gort Framing Studio until the end of April 2019. An unusual and exciting opportunity to see the prolific Steve Stapleton’s art work within his local vicinity. These are his original artworks designed for album covers. Steve lives locally, and quietly. Over the waters he is an acclaimed international artist who has a devoted following for his creative outputs. Steven Stapleton is a British artist and sonic adventurer and the only constant member for the past 30 years of experimental, avant garde band Nurse With Wound. Steve Stapleton is also a graphic artist and painter and has designed many album sleeves and book covers. Under the name, Babs Santini, Stapleton has created the artwork for most of the Nurse With Wound recordings, as well as for other artists, such as Coil, Sand, The Legendary Pink Dots, Current 93 and others. With Stapleton’s art it is clear that there is a dark and irreverent vision, not without artistic precedents and contemporaries. The list begins but certainly doesn’t end with Goya, Kurt Schwitters, Max Ernst, Raoul Hausmann, the Dadaists, The Situationists and Martin Kippenberger, artists that defy easy categories and for whom conventions were meant to be upended, lovingly and unexpectedly, used and abused and battered into unconventional and sometimes rather beautiful shapes. Stapleton is often seen as one of the pioneers of the British industrial music scene, alongside bands such as Throbbing Gristle, Coil and Psychic TV, although in his music he has explored a wide range of styles, including free-form improvisation, musique concrete, drone, folk and even Latin American Dance rhythms. Nurse With Wound is Stapleton’s main outlet for his musical and sound art works, occasionally in collaboration with other musicians such as Coil, Stereolab, SunnO))), Faust, Whitehouse and other underground luminaries. He has also appeared on records by other artists and worked as a producer. He has run the United Dairies record label since 1978, which apart from the Nurse With Wound output, released records by many experimental artists including Irish contemporary composer Roger Doyle’s avant ensemble, ‘Operating Theatre’, legendary improvisation group AMM and krautrock masters Guru Guru. We are delighted to have some of Steve’s visual art work displayed in the Gort Framing Studio until December 2108. This follows his recent one man show , Doing what we Are Told Makes Us free, and sleep concert at the Burren College of Art in May ,2017. The next images are just a few of Steve’s many album sleeves, this first one uses an image captured on camera by our very own Gort Framer, Andreas Edler. Vanna Shanash -Turner has returned to us at The Gort Framing Studio with new work. Vanna will be exhibiting into the month of October. Vanna’s striking pencil drawings are of wildlife, mostly from Africa, where she spent some of her life before coming to Ireland 12 years ago. She has a passion for nature and wildlife, and likes to capture the living essence of everything she draws, paricularily in the eyes, which is her favourite part of a drawing. The eyes often follow the viewer around the room! The Gorilla certainly does. She is self taught in her drawing skills. 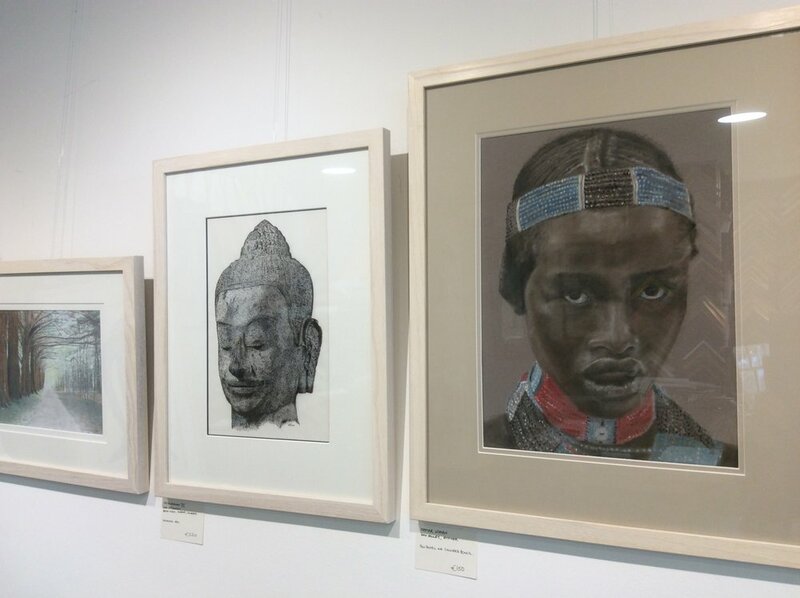 The art works exhibited are drawn in pan pastel and coloured pencil. Vana’s art work is for sale and on display at Gort Framing Studio, Gort until mid October. You are welcome to come in and have a look. We are delighted to have local artist Deirdre O’Brien exhibiting her paintings in the Gort Framing Studio this month. where she has lived for nearly 40 years. She paints using a variety of media, concentrating recently on watercolour and oils. slideshow of Deirdre’s art work. Exhibiting in the Gort Framing Studio is a collection of landscape watercolours of western Australia, painted in the style of the Hermannsburg School. This movement originated in Alice Springs in the 1970s , bringing to fame Albert Namatjira. These paintings are by his contempories, both emerging and established artists. Located 125 km west of Alice Springs, in Central Australia, Hermannsburg was founded by Lutheran missionaries in 1877. The Western Arrernte people have lived in this region for thousands of years. In 1941 Rex Battarbee founded the Aranda Art Group, which controlled the supply of materials and helped handle the business affairs of the emerging artists. Early works by Albert also conveyed this spiritual connection with the land. They shared an intimate knowledge of the land on which they had lived for thousands of years. The Ghost Gum features prominently in the works, a sacred and important part of Western Arrernte mythology. The paintings exhibited here were created across a range of 40 years or so, from the 1970s to the present day. The Hermannsburg style continues to develop and there are many established and emerging artists painting today. Exhibition runs through April and May 2018. Paintings are for sale and sales help support these emerging artists . We now stock a range of artist’s materials. Essential supplies at reasonable prices! A good range of colours of Winston and Newton artist oil paints, watercolour and acrylics, as well as canvases, paper pads, charcoal, and gesso. No need to travel further afield to the big towns for that one tube you have run out of! Parking is usually easily found in front of the shop. For a full list of stock see below...but we will be adding to this stock as time goes on , and when the customer demand is there, so let us know what you would be interested in. Winton oil paint is bright and beautiful, this affordable range of colours is perfect for artists who need large quantities of colour. All of the tones have been carefully made to bring out the best of each pigment, so you can create bold and vibrant artworks. We think you'll be very pleased with the results. We have a good range of colours , 37ml tubes for €4.50 each. boxes of soft pastels, oils pastels, willow charcoal and charcoal pencils. a selection of packs of brushes which we will be expanding on. Don’t forget to let us know what materials you would be interested in , and we hope to see you in the framing studio soon. Aisling lives in County Galway ,she loves her work as a massage therapist and essence maker in the Resting Tree , Bothar Mor in Galway City. She is inspired by nature and cats. Colour and texture light up her world . Aisling describes below what inspired her to create the paintings we are presently exhibiting. Materials include natural dyes, screen paint, acrylics and tissue paper . “At the start of this year, I was approached by the poet, Aoife Reilly. I was so inspired by all of Aoife's poems it took weeks to settle on which ones to paint. I choose ‘August Mullach Mor’ ,’Spring Medicine’ and ‘Hydrogen plus Oxygen’. After reading them over, I wanted to try and paint the poems. The imagery within the poems felt so naturally familiar: the words had such texture that it was like a creative blood transfusion into my days. In ‘Spring Medicine’, it was the words. The words bottle the enchanting scent of gorse enchantment in February; when you drink in and hang on to any colour you can find after the blank canvas of winter. It was the watery-ness of ‘Hydrogen plus Oxygen’ - words that explain the feelings of water like, “water laps like a lullaby, my water sears the air”. The crystal clarity and gentle compassion in this poem grabbed me. In “August Mullah Mor”, the poem sounded like a cry: one that awakens a birth right of ever person to be a witness to this amazing life force we have been given . Here you will find three of Aoife Reilly’s poems . Vanna Shanash-Turner ; pastel and pencil drawings. We are delighted to host Vanna's first exhibition of her artwork . Vanna has no formal training and is self-taught . The natural world is her greatest inspiration. She strives to capture the essence of each sibject, and to connect the viewer to the beauty and transience of Nature. Grey Wolf . Pan pastel and coloured pencil. Detail of pen work in "Jayavarman VII "
Currently exhibiting in our Studio gallery is work by photographer Andreas Riemenschneider. Not to be confused with our own Andreas the Framer, but they do have some things in common! Drop into the Studio to have a look at the photographs, we have a few more than listed here. Framed photographic prints €135 each, approx 60x50 cm. We also have a selection of small mounted prints. Born in East Germany in 1971, Andreas moved to Ireland in 2001, and has been living (mostly) in the West of Ireland ever since. Photography always interested him, but it wasn't until around 2005 when he started to seriously get into photography. Like most people he started with landscape photography, which is something he still loves to do, but recently he got more into portrait and documenting the here and now. Andreas' pictures have been published in The Clare Champion, The Clare People, The Irish Farmers Journal, The Guide to the Wild Atlantic Way, and several websites. He shot the album cover for Irish musician Fia Rua's album, The Sky Went Low And The Sea Went High, as well as promotional images for his tour booklet. Not to forget our shop front photo, the one we use for the website and Facebook banner ! Framed photographic prints €135 each, approx 60x50 cm. This photograph of the Cliffs Of Moher has an incredible 3d effect when viewed in real life. Andreas also does commercial work if you need someone to cover your event, whether you are looking for a family or a business portrait. You can contact him through email cosmofoto@outlook.com or here at the FramingStudio. We opened the doors of GortFraming Studio 10 years ago today. Yes, 10years, we had to double check this by looking out the old lease! To celebrate we launched this new shiny website at a gathering in the shop with friends, family and passing customers yesterday evening. Pete Lamb set the atmosphere by playing a good few songs and ended with Prince's Purple Rain. Folk came and went from far and near, and we would like to thank them all for their support, particulary to the family members and friends who have helped out in the studio with everything from customer care to painting the walls. Not forgetting our customers, ranging from renowned international artists to Gort Secondary school's student rug makers. Our new web site is designed by the very patient Eamon Kerrins (eamonkerrins@gmail.com). 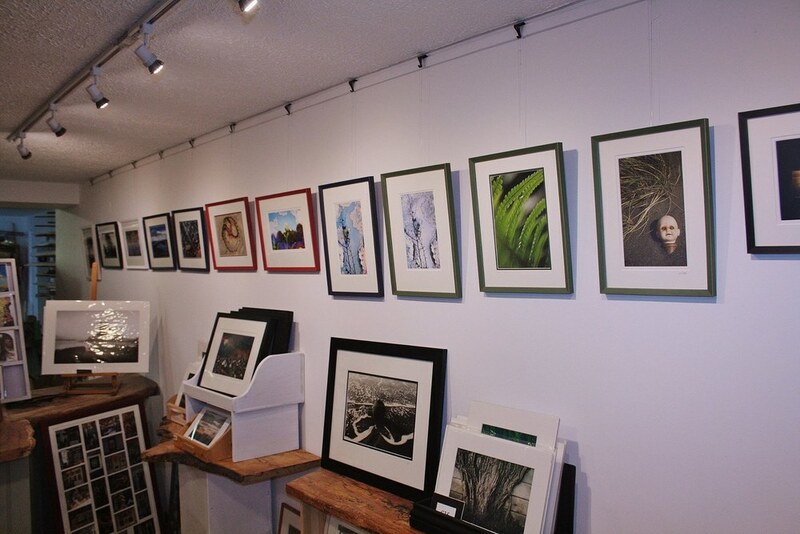 We have a small gallery in The Framing Studio. If you would like to exhibit here please contact us. You don’t have to frame with us to exhibit-but it helps! We also stock and display local arts and crafts ,pottery, jewellery , printmakers cards, and photographic prints.